Total housing starts expanded 9.8% month-over-month in June, reaching a 1.174 million annual starts pace. The strong growth rate was driven by the multifamily sector. According to the estimates from the jointly published Census Bureau and HUD June report, single-family starts were effectively flat, recording a 0.9% monthly decline to a 685,000 seasonally adjusted annual rate. 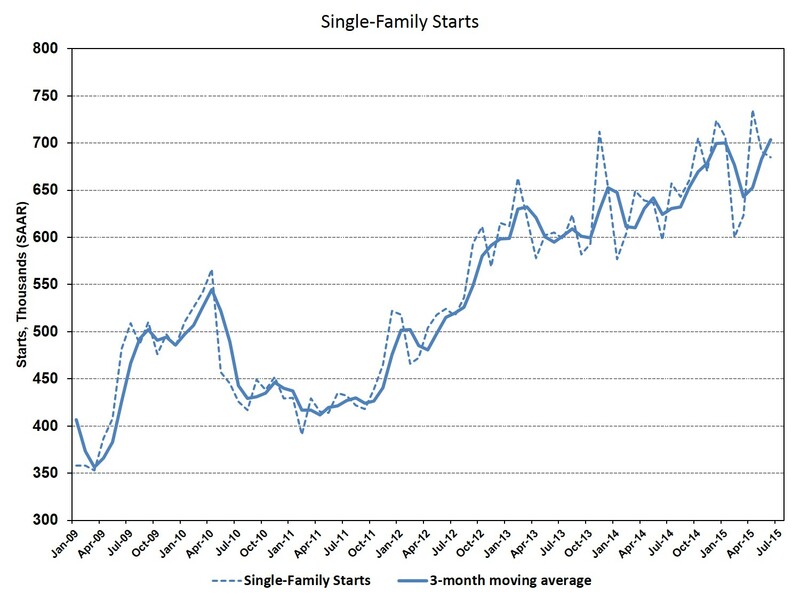 Single-family starts were up 14.7% over the June 2014 pace and, as measured on a three-month moving average, hit a post-recession high in June. Single-family permits were up 0.9% for June, reaching a 687,000 annual pace. Permits were up 6% year-over-year. Regionally, single-family starts were up 6.8% for the month in the South, but down 27.3% in the Northeast, 7.1% in the West, and 4% in the Midwest. Multifamily construction starts (units in buildings with five or more units) reached elevated levels in June, climbing to a 476,000 annual rate with a 28.6% monthly growth rate. Permits also expanded greatly, jumping 16.1% to a 621,000 annual rate. Estimates of the number of housing units currently under construction highlight the degree to which multifamily starts have grown over the last year or so. As of June, on a seasonally adjusted basis, there were 500,000 multifamily units (in building with five or more units) currently under construction, a 20.5% gain year over year. This contrasts with just 372,000 single-family homes currently under construction, 8.5% higher than June 2014. Going forward, NAHB expects single-family construction starts to continue to record positive yet modest gains with growing homebuyer demand. While the growth will be constrained by certain supply-side headwinds, most notably lack of building lots and access to labor in some markets, builders continue to express rising confidence, as reported in the NAHB/Wells Fargo Housing Market Index. We further expect multifamily growth to cool given the rising volume of units in the production pipeline. Do you know how the growth percentages are divided among various price ranges for single-family homes? Also, what about which regions of the U.S. is experiencing the most growth? For price range data, check out the most recent Census new home sales report (https://www.census.gov/construction/nrs/index.html ). Hints of some improvement at the low end recently.